Keto cheesecake bites + cheesecake fat bombs in one - just 1 NET CARB each! You only need 6 ingredients needed for this mini low carb cheesecake bites recipe. This post is sponsored by LC Foods. All opinions are my own and I only share products I personally love. Thanks for supporting the brands that make this site possible! 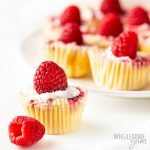 Since keto cheesecake is the most popular dessert on Wholesome Yum, I thought I’d share a mini low carb cheesecake bites recipe that gives you similar flavors in a portion-controlled treat. Plus these are crustless keto cheesecake bites, which equals fewer carbs and super easy! If you want a change from the usual chocolate fat bombs, cheesecake fat bombs add some nice variety. I made my mini cheesecake bites with powdered erythritol from LC Foods. It makes a great replacement for powdered sugar, but is not quite as sweet. I love it! 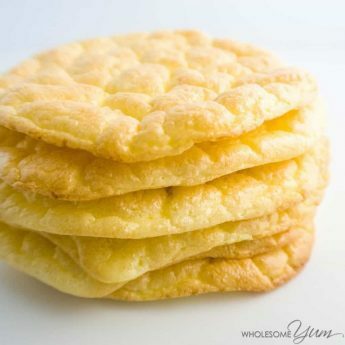 If you are sensitive to the cooling effect of erythritol on its own or want a 1:1 powdered sugar replacement, try their low carb powdered sweetener blend (use 1/2 cup instead of 3/4 cup). Enter code WHOLE10 at those links to get 10% off both at LC Foods! I’m so excited to show you how to make cheesecake bites that are low carb and keto-friendly! 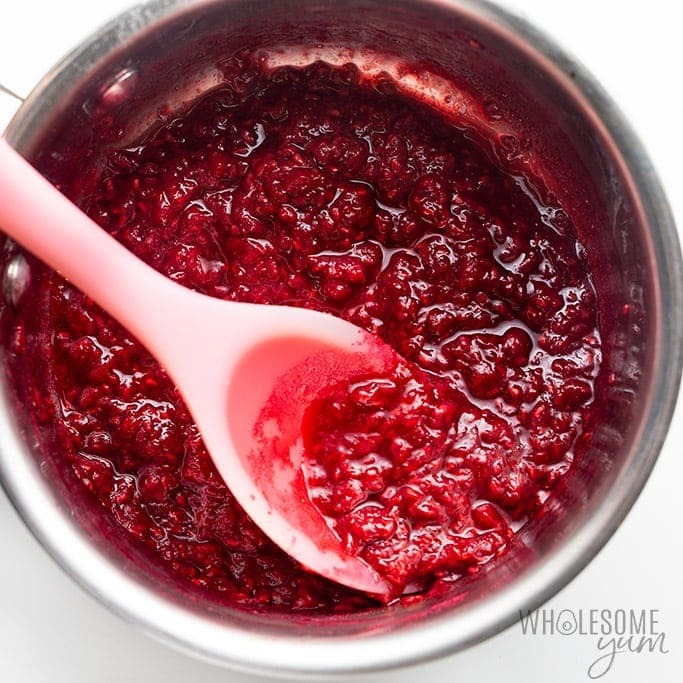 Making sugar-free raspberry sauce is super simple! Simply heat raspberries, water, and powdered sweetener for a few minutes until the raspberries soften. Mash them, then simmer for a few more minutes until it thickens. TIP: Don’t leave the raspberries unattended because they will burn rather quickly. Stir them to prevent sticking to the bottom of the pan. 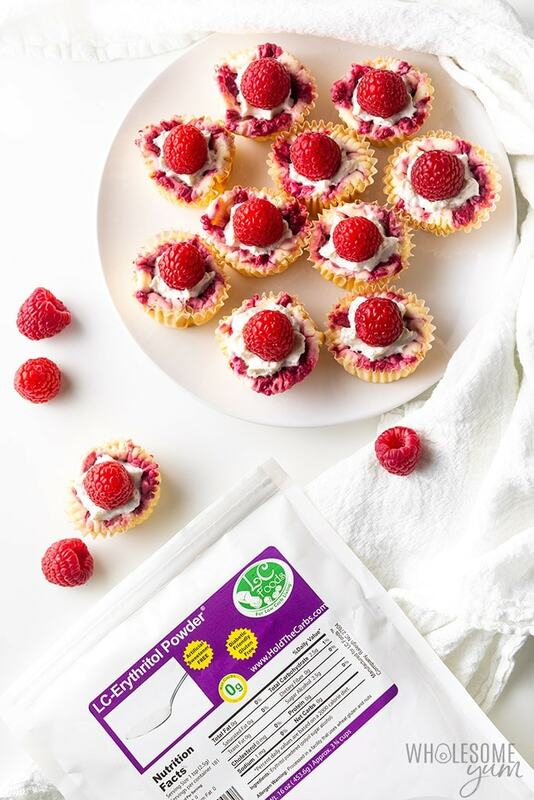 For even easier raspberry cheesecake bites, you can also skip this step if you’d like and simply use LC Foods sugar-free raspberry preserves instead. Making the filling is just like making cheesecake. Beat the cream cheese and powdered sweetener at a low to medium speed with a hand mixer, until it is fluffy. TIP: Use low speed and don’t over-mix. 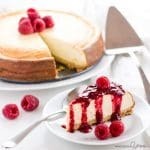 Doing so can introduce air bubbles, which will affect the texture of your low carb cheesecake bites. Next, slowly add in an egg, followed by lemon juice and vanilla extract. The mixture should be smooth. Add the cheesecake mixture to the mini muffin liners. Next, add raspberry filling on top of each cheesecake. Take a toothpick to swirl the raspberry filling so it looks pretty. 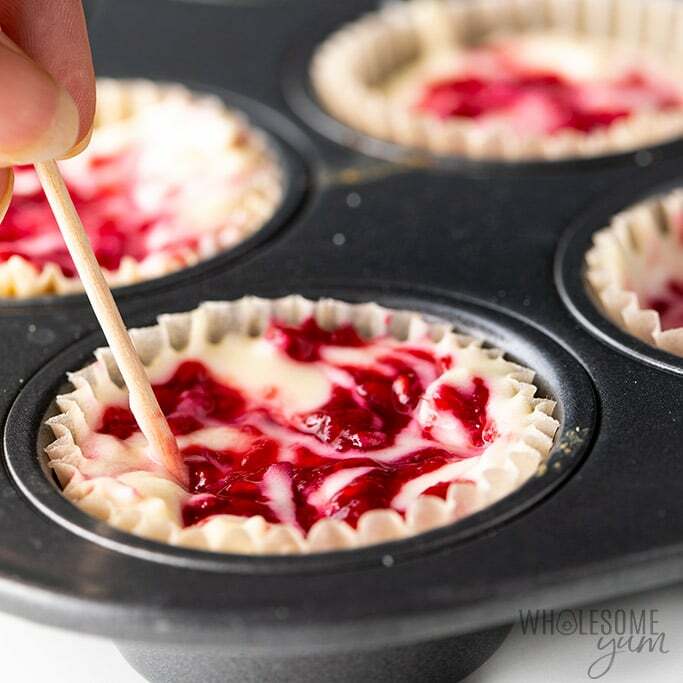 Place muffin tin in the oven and bake until the cheesecake bites are puffy, but slightly jiggly in the centers. Once the low carb cheesecake bites are done baking, allow them to cool on the counter until they are room temperature. Place them in the fridge until they are cold and have firmed up, which will take around an hour. PRO TIP: Don’t be alarmed if the keto cheesecake bites fall in the center a little when you remove them from the oven. This is normal, and you didn’t do anything wrong – it’s all the better for filling with whipped cream. 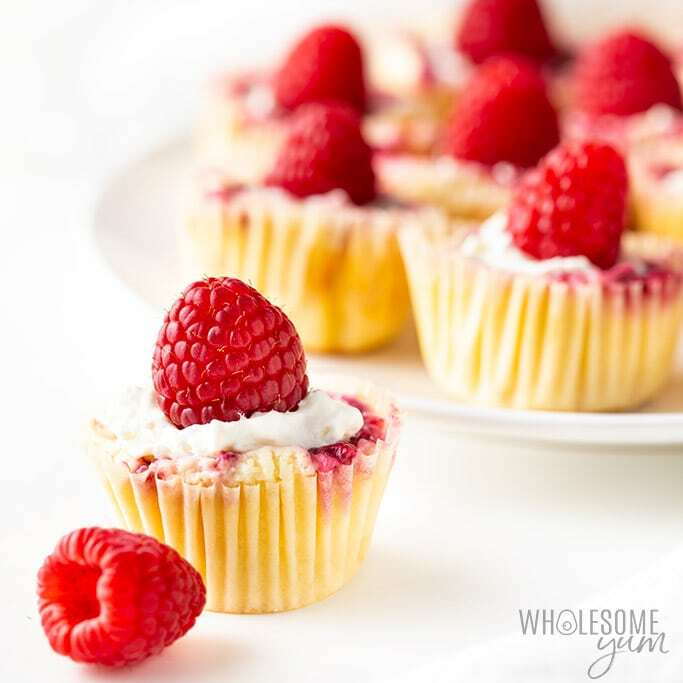 To serve these gorgeous keto cheesecake fat bombs, add some whipped cream and garnish with a fresh raspberry. Enjoy! Dark Chocolate – Everything is better with a little bit of dark chocolate! 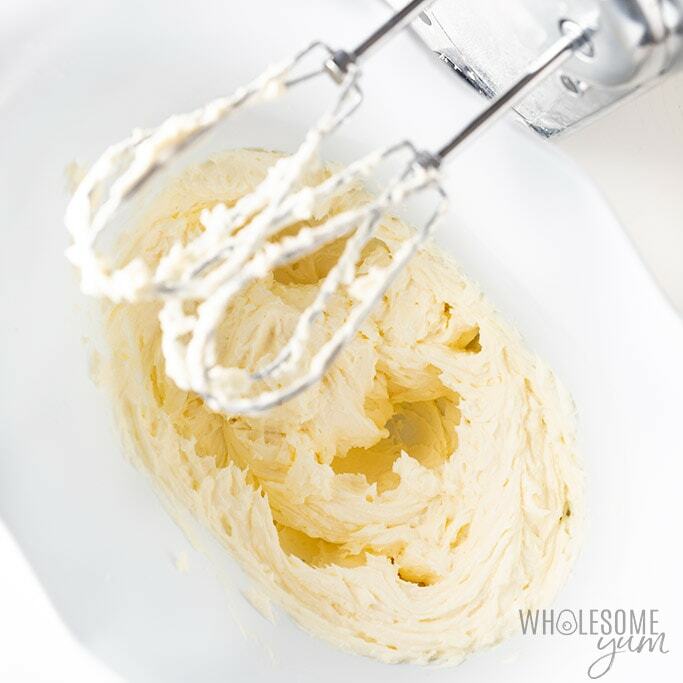 Shave a few curls and put on top or add some to the batter when baking. Toasted Coconut – Adds a little bit of a crunch and different flavor to the cream cheese fat bombs. Plus, toasted coconut is delicious! Pecans – Crush a few pecans and sprinkle on top before serving. They taste great and add some texture. Sugar-free caramel sauce – So good drizzled on top! Why Do Mini Cheesecake Bites Crack After Baking? Just like a regular cheesecake, mini cheesecake bites can crack after baking if you over-mixed the batter during the preparation process, or from sudden temperature changes. Keep the mixer on low when beating the ingredients, and let the bites cool at room temperature at the end before chilling. How Do You Store Mini Cheesecake Bites? Store leftover mini cheesecake bites in the refrigerator for up to 5 days. Make sure they are in an airtight container, so moisture and air don’t get to them. Can You Freeze Cheesecake Fat Bombs? If you aren’t going to eat the low carb cheesecake bites within five days, you can freeze them. These easy keto cheesecake fat bombs will last approximately 6-8 months in the freezer. They are ideal for grabbing a couple out when you need a quick snack. Simply thaw on the counter for a few minutes to soften before eating. 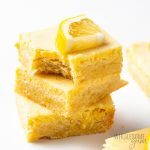 If you love these keto cheesecake bites, here are more easy and delicious keto dessert recipes. They’re wonderful for all kinds of holidays! Stand Mixer – If you don’t have a stand mixer you are missing out! I love how easy it is to use, and you can make so many recipes. 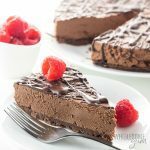 Not only can you make low carb cheesecake bites, but you can shred meat, blend meatloaf, and all kinds of things! Mini Muffin Tin – This cheesecake bites recipe will make 24 mini muffins, and that is precisely what this pan has. Preheat the oven to 350 degrees F (177 degrees C). Line a mini muffin pan with 24 parchment liners. Place the raspberries, water, and powdered sweetener into a very small saucepan. Heat over low heat until the raspberries start to soften, about 2 to 3 minutes. Use a spatula or back of a spoon to smash the berries. Simmer for a few more minutes, until the sauce thickens. Remove from heat and set aside. Using a hand mixer or stand mixer, beat the cream cheese and powdered sweetener together at low to medium speed, until fluffy. 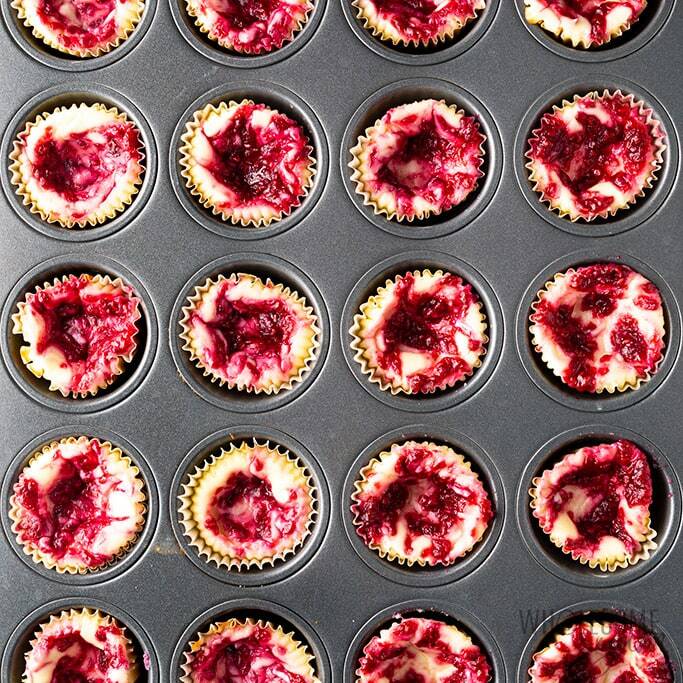 Spoon the cheesecake filling evenly into the muffin liners. Spoon a 1/2 teaspoon (2.5 mL) of raspberry sauce over each cream cheese cup. Use a toothpick to swirl into the batter. Bake for 10 to 15 minutes, until the bites are puffed up and almost set, but still jiggly. Remove the cheesecake bites from the oven. They might fall, which is normal. Cool completely at room temperature, then chill for at least an hour, until firm and cold. To serve, pipe a dollop of sugar-free whipped cream into the center of each bite and top with a fresh raspberry. Question; I am not a raspberry fan at all. If I ground up some almonds and mixed them with a liittle MCT oil for the bottom crust, how do you think that would work. It would give it a little bit of crunch and a crust. Would that make it too much of a fat bomb? As well, swirl a couple of drops of dark chocolate in the mix before baking. Thank you, Maya. 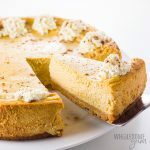 I love cheesecake and this is a great way for me to get my fats on Keto. My husband and I are on Keto. I am serious healthy keto for past 2 months. My husband is Lazy keto. I thought I could make these for him but worried if I tried 1 and only 1 just so I can see how it came out, that it would take me out of sync. Would it? OMG I am sooooooooooo excited to be able to surprise my husband with his favorite treat! Thank you for making this happen for us! I do have a question though, I am brand new to Keto and am in the process of building a new pantry stock. I got some Natural Mate Stevia All Purpose Natural Sweetener, because I have tried and tolerated it in the past. I don’t have any powdered erythritol yet, your calculating exchanger ALSO brilliant BTW said not so much, is there a way to make this work until I can afford to pony up for the other good stuff? Hi Jenny, The reason not to use granulated sweetener is it would be grainy. If your sweetener is granulated (such as the one you mentioned), you can try powdering it in a coffee grinder or food processor. Once you get it to a powdered consistency, you can use that but would need less than the recipe calls for. Can I use monk fruit sweetener instead? And if so what is the recommended amount? Hi Sean, I haven’t tried it with monk fruit sweetener, but you can try converting using the sweetener calculator here. Absolutely delicious! I made these this morning. The only ingredient I’m missing is the erythritol so I need to pick some up stat so I can make these pretty little cheesecake bites! Such a fun recipe – thank you!! My kids really loved it! Such a delicious treat! Cheesecake is my biggest pregnancy craving at the moment, so I would be all over these. Wow, these are so good! I almost wanted to eat them all myself. I love bite sized desserts especially for a party. Gives everyone a chance to try a few different things though I know these will be the first to disappear. These always cure my sweet tooth. I’m in love with that raspberry swirl topping!